Olives are most commonly associated with Mediterranean cuisine, though archeological findings show they were first cultivated and eaten in ancient Mesopotamia around 6,000 BC. Olive trees favor coastal climates and are native in the Mediterranean, northern Africa, and eastern Asia. 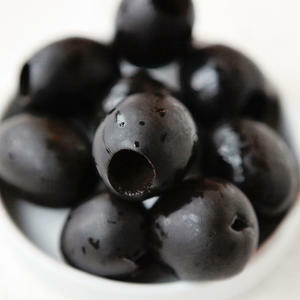 There are some olive trees still producing fruit that that are over 2,000 years old! Olives and the olive tree have huge symbolic significance across cultures and are featured in many religious texts and mythologies of these areas. Olive trees were brought to America (particularly to California) by Spanish settlers. All olives are rich in Vitamin E and polyphenols, though because of the curing process, they are high in sodium and should be enjoyed in moderation. Olives have a large stone, or pit, inside them, so always double check your jar or can to see if the olives have been pitted.